Zengobi's Blog: Curio 5.4, Evernote, and Macworld special! We just released Curio 5.4 with an extra spiffy feature: integrated Evernote support! With the new Evernote shelf built into Curio 5.4 you can now easily search for notes stored on Evernote's service in your account. Searching can include text, tag, kind, and modification date. Then drag-and-drop the results directly to your idea space. Any found images dragged into an idea space will retain their "optical character recognition" data so searching within Curio using the Search shelf will also find those same images. 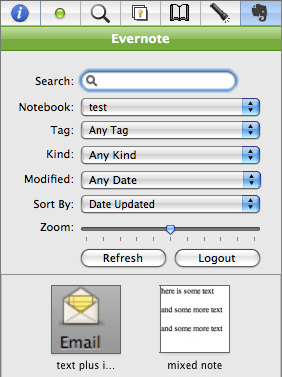 And Curio will automatically map your Evernote notebooks and tags with Curio global tag set tags. That way any Evernote items dragged into Curio will be automatically associated with their corresponding Curio tags. The combination of Curio's Evernote shelf and Evernote's free iPhone app and service means that on-the-go brainstorming and idea collection is now easier than ever. In addition, Curio 5.4 includes several iCal sync improvements to make syncing more reliable. Plus tweaks to Sleuth, mind map drawing performance, and tons of other little fixes and tweaks. Read the complete release notes for all the details. To celebrate the Curio 5.4 release during this week's MacWorld Expo, Zengobi is offering a 20% discount for any Curio purchases made this week from our online store. Just use the coupon code MACWORLD2009 when making your purchase.